Democratic Presidential Nominee, Hillary Clinton, announced her plans, via Twitter on September 21, for increased regulation in the healthcare industry. Mrs. Clinton sought to fulfill this need after a The New York Times article, found here, was published citing a drug with a price increase from $13.50 to $750 overnight. This “price gouging” by pharmaceutical companies is at the forefront of reform in Mrs. Clinton’s plan for increased regulation. But, what does this mean for investors? In a week following the tweet by Mrs. Clinton, major biotech indices were down more than 20%, according to this article published in the Wall Street Journal. 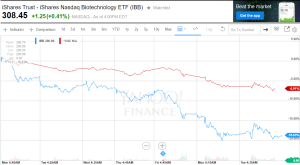 In the chart to the right of the iShares Biotech ETF (IBB), which seeks to track NASDAQ listed biotechnology and pharmaceutical securities, and the NASDAQ Composite, a market index for healthcare and technology securities, the IBB declined 11.72% more than the NASDAQ Composite. This discrepancy of 11.72% creates a unique event centered around the effects of Mrs. Clinton’s tweet. Meaning her announcement, via Twitter, was unexpected by the market and the securities exposed to such regulation were impacted more than the broad market. 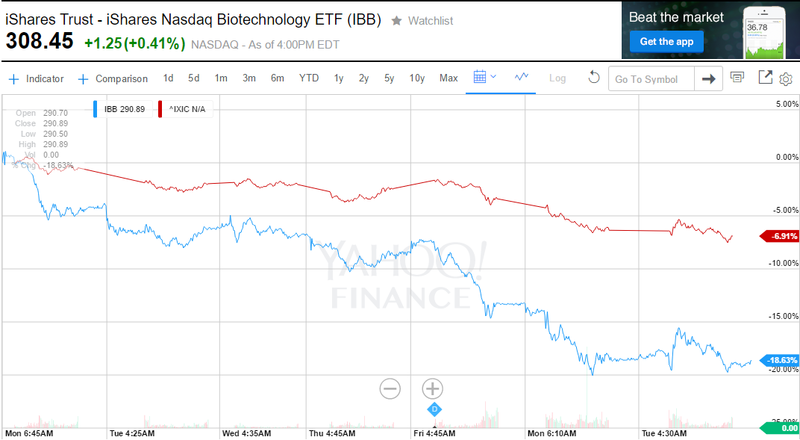 Therefore, investor portfolios with exposure to biotechnology were largely affected by Mrs. Clinton’s tweet. Marketing costs, which are heavily utilized for market exposure of newly patented drugs. Without higher prices to drive R&D and marketing, these companies would be unable to research and develop leading treatments and cures in areas like immuno-oncology. The proposed policy changes by Mrs. Clinton, found in this article, are centered around new medicines on the forefront of disease transformation. Since,according to the article, roughly 70% of new drug developments are completely new approaches in fighting disease, then Mrs. Clinton’s plan to restrict price gouging will subsequently affect the budgeting and allocation of capital to R&D spending for new drug development projects. This lowers the incentive for new drug development, putting significant pressure on companies determined to find a cure for rare diseases. Just think if the developments toward hepatitis C and metastatic melanoma were never funded, then treatment would never have been developed and these diseases would still be considered a death sentence. Instead, Mrs. Clinton should focus her efforts away from price gouging in new medicine and toward helping patients by lowering costs and market timing for more generic drugs, thus saturating the generic drug market and eliminating “perpetual monopolies for old, off patent drugs like Daraprim”, as described in this article. This was a very interesting article. As with any political issue it is hard to take any information without second-guessing people’s motives and agendas. The prices of medicine is commonly debated and often times very heated and emotional. I feel that with any political topic it is unhealthy to look at one fact and focus on it, without looking at other views, sources, and situational factors. However I feel that your blog was extremely informative, as were the resources provided. The last article in particular was very interesting. It is a good analysis of if the issue of high drug prices is true or false, but rather a critical thinking problem. I never realized the large problem of generic drug market manipulation. As a student of business I understand a product is not a price of the materials, rather a combination of materials, workers, research & development, risk mitigation, and another couple of hundred factors. It is hard for me to morally argue that we need to “artificially” raise prices of something that could save someone’s life. However you cannot lose the forest for the trees. Price cuts on drugs would obviously lead to drug companies taking less risks on developing new-age miracle drugs because they don’t have the financials. We need to motivate companies to continue to develop these drugs for the sake of advancing ourselves forward. The way to do this is not through regulation, allowing them to charge prices that will allow them to continue on. We would see a decline in the development of new drugs 10 years down the road from now, not to mention the immediate adverse effects in the financial market in the United States. I liked the format and accessibility of the information nearly as much as I liked the content. The format was aesthetically pleasing and the content was mentally stimulating. Price gouging is very important and it is incorporated into healthcare firms as well as other industries in the market. Not only healthcare firms should be concerned with Mrs. Clinton’s plan to restrict price gouging, but instead all of us should be concerned. Not only will R&D spending go down for new drug development, but some jobs will also be lost in the process because of Mrs. Clinton’s plan. I feel that whenever a company comes out with a new product and the FDA approves it, the stock of the company will increase as well as profits for the company when the new drug is put on the counter for consumers to buy. This gives money back into allocation of capital to R&D spending for future drug development. 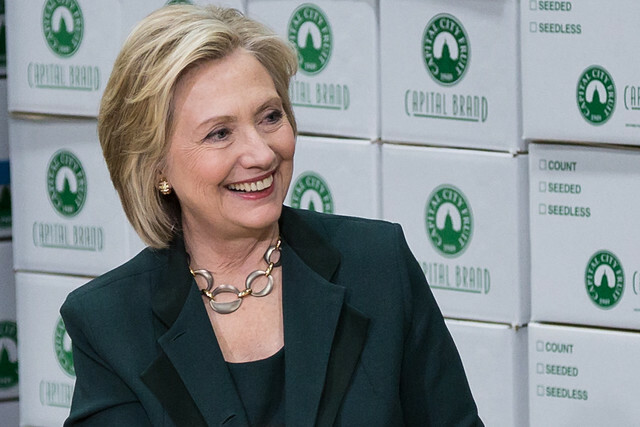 Therefore, Mrs. Clinton should rethink her approach about restricting price gouging.